Renovation updates the structure and layout, making way for the latest mechanical, electrical, lighting and audiovisual systems. The Husky Union Building is finally opening. “Opening the HUB” was in fact the overarching theme followed by the Perkins+Will team throughout the five-year design and construction process. Standing on essentially the same building footprint and constrained by existing campus roadways and paths, the new HUB has been transformed into a more spacious, connected, accessible and inviting building than its predecessors. Perkins + Will’s design team met with Lincoln Johnson, director of the HUB, Paul Zuchowski, the associate director, and key student groups through a yearlong process to define the program and identify the key project goals: creating a welcoming space, opening up the building, connecting to the campus and building community. 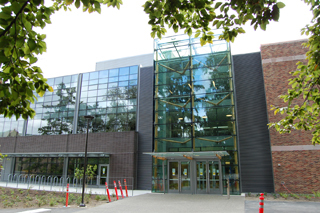 The HUB’s west facade was preserved while a new staircase and atrium were built behind it. The design itself took two years, undergoing rigorous review from all the stakeholders, including students, the Capital Projects Office, UW facilities and engineering, and the design commission. To assist in the decision-making process, the key project goals were used to filter and evaluate design and programming concepts throughout all the design phases. Since its opening in 1949, the HUB has undergone several small remodels and larger periodic additions. The tinkering began in 1952 and continued through 1959, 1963 and 1975, with the most recent additions occurring in 1982. HUB versions 1.1 through 1.9 updated the original building to meet then-current student trends, but due to their limited scope resulted in compromises that threatened the planning logic of the building and its connection to the campus. A version 2.0 was needed to revitalize the HUB and set the stage for a 21st-century center for student life at the University of Washington. The decision was made to remove the majority of the building’s exterior, preserving only the most iconic and architecturally significant components of the building from the original 1949 and 1952 construction. Within these areas, large portions of the building structure were preserved, refurbished, reprogrammed and stitched neatly back into operation. 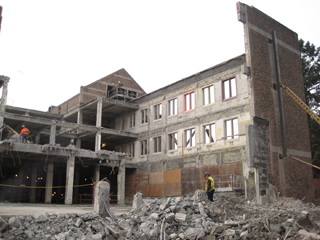 The majority of the building infrastructure was evaluated, and antiquated systems were removed to make way for the latest mechanical, electrical, lighting and audiovisual systems. A new glass-enclosed entrance was built on the north side of the building, providing a bookend for the historic west facade, at right. The structural systems of the building were also subject to this intense level of analysis and evaluation. This led to a number of instances where it made more sense to remove and replace elements of the existing building in order to preserve critical areas. For example, the original auditorium was a heavy concrete black box resting on undersized concrete columns. Saving it would have involved large and costly cross bracing that interrupted every major area of the building. By demolishing it and rebuilding it with a lighter structure and a flat floor, it not only saved money but also provided a more flexible multipurpose space that was open and connected to the campus. At the north end, the west facade of the 1949 building was preserved while a new staircase and atrium were added behind it. The structural floors and columns behind it were too complicated and unsafe to stitch back together once these large openings were added. The original HUB was a hodgepodge of uses on multiple floors stacked on top of each other. Finding your way around was a common problem. Student services were spread throughout the building, and due to the multiple additions, often buried and away from daylight. Perkins+Will introduced a long atrium through the first, second and third floors, carving through the existing structure, to bring daylight and ventilation in, and to create a new heart for the HUB. The atrium at the south end extends down to connect to the dining areas, new south entries and the bowling alley floor below. The atrium ceiling rises skyward, capped with seven 10-foot-tall glass monitors, creating an iconic beacon visible from the campus and HUB lawn. The atrium’s entry floor was envisioned as a street that connects pathways and campus elements through the building, from Denny Hall at the north entry through the building’s southwest entry to Drumheller Fountain. A 10-foot-wide fireplace marks the grand lounge area, intended as a new living room for the campus. 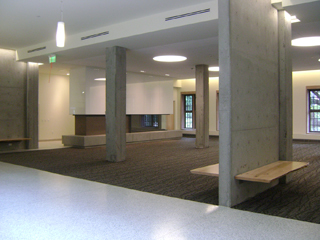 The entry-level floor welcomes visitors with a large purple “W” centered in the middle of the “street.” Two 10-foot-wide fireplaces flank the grand lounge area, a new living room for the campus that offers views of the campus and the HUB lawn. All the major programmatic elements and services for the HUB open onto this atrium. The atrium walkways, lined with glass railings, visually connect all these services and are shifted at each floor to promote communication between levels. Three delicate steel-and-glass staircases dramatically float inside the atria, offering a venue for casual interactions. An 11-foot-tall wall of travertine stone, salvaged and refurbished from the original HUB lobby, lines the east side of the “street.” On the west side of the atrium, wood paneling finished with rock elm extends vertically two stories to cover the ceiling of the three story space. The introduction of an atrium also contributed to the sustainability goals for the project by bringing in daylight and providing openings for natural ventilation that reduced the energy use for lighting and mechanical systems. The HUB employs green strategies such as a stormwater filtration bioswale, extensive use of eco-friendly lumber, salvaged materials and a heat-recovery system that draws from the campus chilled-water system. Visitors can also enjoy the population of bees, which frolic on a green roof that can be viewed from the third floor. The project is seeking a LEED gold rating. The assembly spaces in the HUB  the ballrooms and auditorium  were significantly reconceived and rebuilt. Venues for notables such as Nirvana, Warren Buffet, Bill Gates Jr. and Bill Gates Sr., the two ballrooms were reoriented north and south to offer views of the Cascades. At a push of a button, vertical accordion doors slip into pockets in the ceiling, transforming two ballrooms into one 215-by-60-foot space for ceremonies, conferences, banquets, fairs and rock concerts. Wood paneling lines the wall spaces and features a custom-perforated pattern of the Olympic rainforest. On the first floor, a 5,000-square-foot auditorium named the Lyceum was renovated by demolishing the old sloped theater seating and black-box concrete walls. The new resilient ash floor can accommodate a vast array of functions, including concerts, receptions, films and lectures. Large expanses of glass open up the Lyceum to the surrounding campus. Along the glass, there are 22 15-foot-tall airfoil-shaped custom wood panels that rotate to control the both amount of sun entering the space and the views in and out. The original west facades, built in 1949 and 1952, were preserved. Later additions with different construction and architectural typologies were removed. New glass-enclosed “jewel box” entrances are located at the building’s north and southwest faces, bookending the historic west facade. Decorative Husky-purple glass fins accent these entrances, which stand at the end of major campus circulation avenues. A new brick-and-glass skin wraps the renovation. A rich brown brick was selected from the historical facade’s color palette. Large expanses of glass open up the HUB to more daylight while perforated steel awnings offer shade on sunnier days. Terraces off the ballrooms and dining levels face Stevens Way on the east side and overlook a large bioswale. On the west side an expansive brick and stone porch, twice as large as its predecessor, welcome students into the HUB of the 21st century. It wasn’t easy to bring together 60-plus years of HUB history, but the HUB 2.0 is a monument to what can be done when different groups work together to improve a campus landmark. Here’s to at least another 60 years before the next renovation. Ryan Bussard is a senior associate and project designer for Perkins+Will. Scheer Chan is a Perkins+Will project designer.